This page will tell a partition tool, with which you can extend system partition when Windows Server Diskpart command failed to extend it. Download IM-Magic Partition Resizer Server to extend system partition on Windows Server when Diskpart is unable to extend the partition space. It is not a surprising thing if you receive message that system partition cannot be extended after running Diskpart command because this command has many limitations. Well, one of limitation is that Diskpart cannot extend system partition. If you cannot extend system partition with Diskpart command, you can rely on partition software to perform partition resizing. 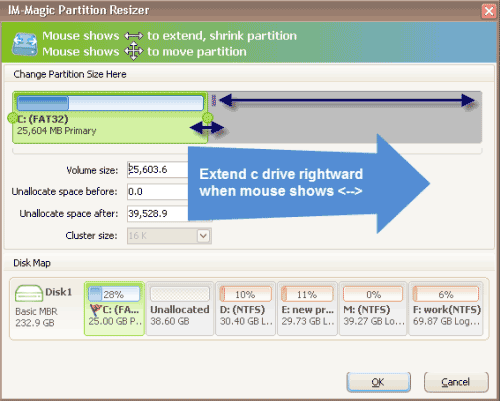 IM-Magic Partition Resizer Server is professional partition software for Windows Server users to resize hard disk when they encounter low disk space problem on system partition or other partition. "I got a message to say that the selected drive cannot be extended when I run Diskpart to extend the system partition on Windows Server 2003. Is there any other solution for system partition resizing on Windows Server 2003? There is only little free space left on this partition and I can get low disk space warning message many times every day." "I realized that C drive is running out of disk space on Windows Server 2003, so I want to extend it by running Diskpart command. However, Windows disables me to extend the C drive saying that the selected drive cannot be extended. Here is the basic information about the system partition. Type: Local disk; File system: FAT32; Status: Healthy (System); Used space: 29.2GB; Free space: 838860 bytes. 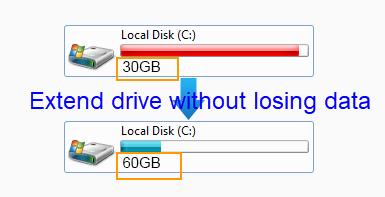 How can I increase the C drive space without reinstalling system?" As you know, a hard disk can be divided into several partitions on PC such as C drive, D drive, E drive and more. C drive is usually used as system partition primary partition, while the rest drives are data partitions. Diskpart command only allows you to extend data partition. System partition is not supported by Diskpart command. Another limitation of Diskpart is that it only supports NTFS partition. If you want to extend an FAT32 partition, you will receive the message to say that the selected drive cannot be extended. Before you can extend a partition with Diskpart command, you should ensure there is contiguous unallocated space to the partition you want to extend. Since Diskpart cannot extend a system partition on Windows Server, IM-Magic Partition Resizer Server is a good choice for system partition resizing on Windows Servers. This partition software has no limitation to help you resize system partition whether it is NTFS or FAT32 file system. Besides, the partition software has the function of shrinking partition and moving partition, so you can create unallocated space and move it close the system partition and finally get system partition expanded. This partition software allows you to extend system partition on Windows Server 2003, 2008, 2012 and other Windows Server operating system. * Can I extend C drive system partition on Windows Server 2003 2008 2012? * How do I deal with the problem that Windows 2003 runs on low disk space on system partition? * Please help that it failed to extend C drive Windows 2003 with diskpart in VMware!